I was the youngest of three children born to Bill and Lee Fuselier in San Francisco. My brothers were Bill and John. Family values of love, faith, responsible citizenship and parish participation shaped my early formative years. I was attracted to the Sisters of the Holy Names through elementary education and sodality due to their friendliness, care and presence among youth, particularly, Sisters Rose Genevieve, Joseph Paul and Shirley Sexton. In the midst of Vatican II I entered in Los Gatos, CA. Following novitiate I became an innovative and creative teacher enhancing classroom experiences beyond 1 + 1 with Christmas pageants, dramatic plays, specialized field trips and live circuses to raise money for UNICEF. My 7th grade teacher, Sr. Jean Morningstar taught me that we are all capable of being artists in our own way. That insight and freedom has surely shaped my life and ministry over the years. That same irrepressible creativity and zest for life and fun shows up In later years as I organized Red Hat Parties for our senior Sisters at Los Gatos. A special highlight was winning the SNJM lottery to attend the beatification of Mother Marie Rose in Rome in 1982. This experience inspired my transition from formal education to pastoral ministry. From parish houses to retreat centers I engaged in pastoral care through counselling, spiritual direction and retreat work. From Menlo Park to Berkeley and even to Africa I have been involved with the pastoral and spiritual formation of seminarians, lay leaders, first professed religious and finally the formators of 30 religious communities. 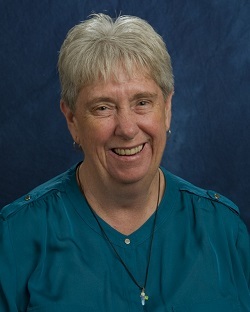 I was able to offer training in skills of listening, pastoral counselling, spiritual direction, homiletics, and retreat presentations as well as discernment for decision making based on Sr. Beth Liebert’s work. Currently I am involved in parish and civic volunteer opportunities as well as hospitality at Villa Maria Del Mar. I await the call of a new dream and prepare to take the risk.